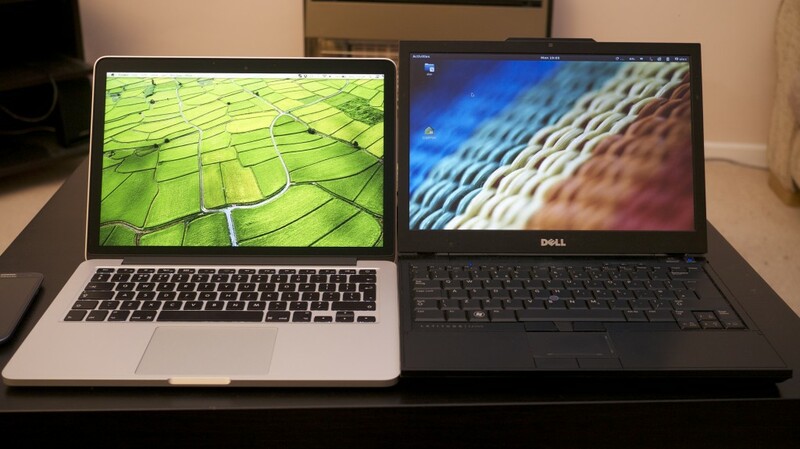 While staying with a friend recently I was instantly jealous of his Belkin Laptop cushion. It looked like a great way to chill out with a laptop in the evening while avoiding a hot lap. While researching the Belkin above though, I came across the Targus Laptop Lap Store Mat, which was almost half the price. There were no negative reviews, so living by the philosophy that if you regret buying the cheaper one you can always get the more expensive one later (poor philosophy, but both are cheap enough to get away with applying it here! ), I decided to give it a shot. 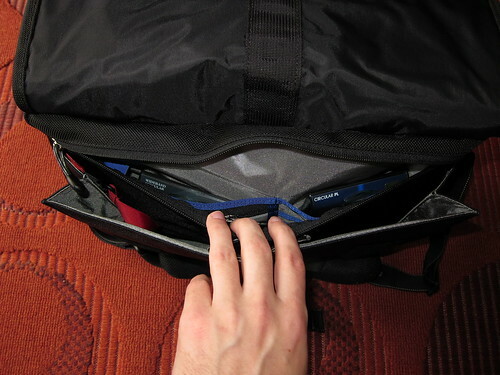 This entry was posted in Reviews and tagged laptop, mat, Review, targus on November 2, 2012 by Alex Forbes. I’m not in the habit of reviewing everything I buy, but it does give me something to post. I picked this up from Progear in Newmarket for $219 (NZD), so it’s not a cheap bag but not absurdly expensive either. Note that I did actually purchase this with my own money and buyers are never totally impartial, but I’m certainly not being sponsored by the manufacturer/distributor/retailer either! The last bag I bought to hold all my gear (a backpack from trademe) cost $79, so it was a cheapie but excellent value for money, more so than this (since the Urban Disguise 70 cost me 2.5x as much). 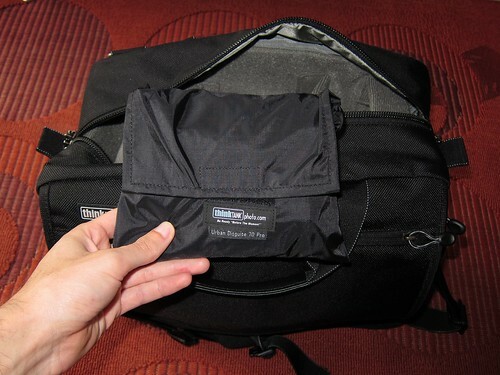 This time around I wanted something that was durable, looked nice but didn’t scream “camera bag!”. And this seemed to fit the bill. Unless you’re in the habit of leaving your camera bag outside on a rainy day, or don’t mind carrying it like a cardboard box, this is a rather useless feature in my opinion. But it does add a bullet point to the marketing materials. 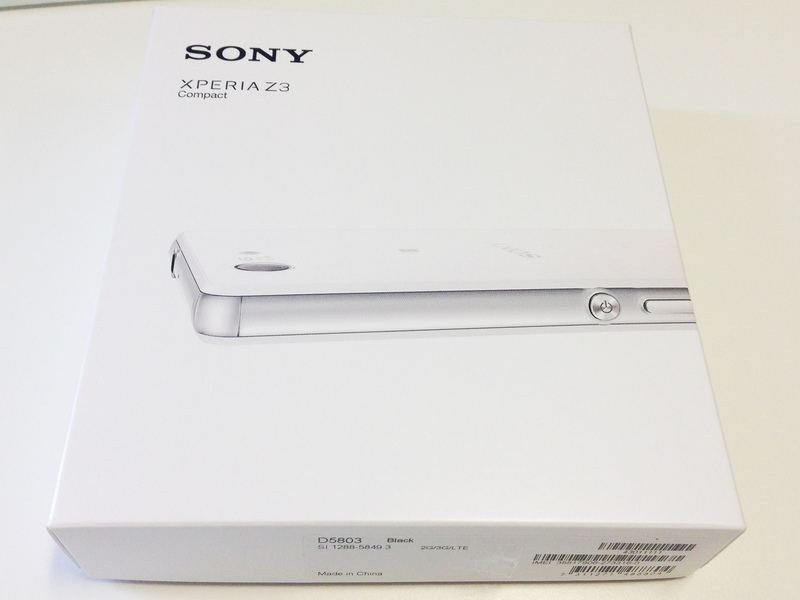 If I ever use it I will be sure to update the review! 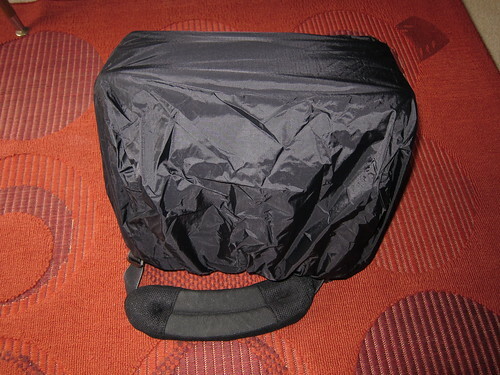 Update: As noted in the comments below, you can actually use the rain cover if you attach the strap to the clips on the “back” of the bag rather than the sides. Maybe I will use it after all. 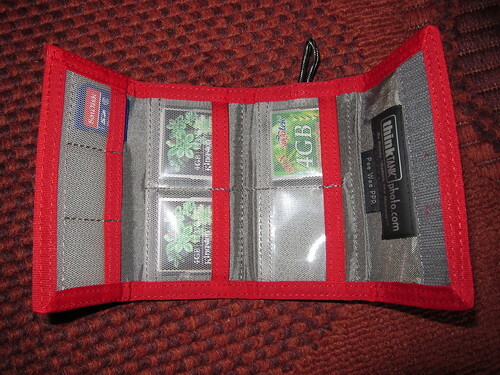 There have been a couple of times when I’ve been concerned about memory cards slipping out of my old bag, so I think this is a great idea. It’s one of those nice extra touches that really makes this a photographers bag, and wasn’t something I was expecting to find (or had even considered). It’s a shame about the gaudy colour though, and the bright blue ribbon it attaches to makes it worse (what’s wrong with gray/black?). As you can see it’s a comfortable fit. 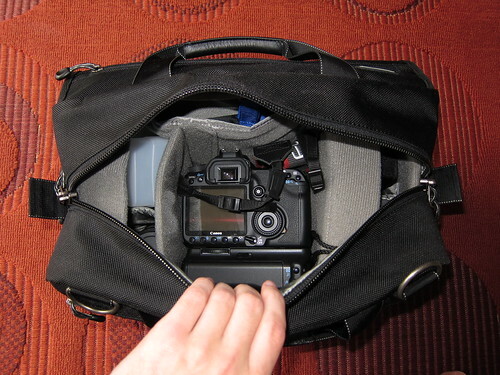 The DSLR has a 10-22mm lens mounted with its hood facing outwards and there’s heaps of room. It also fits with the 70-200 on and hood reversed. I could comfortably fit another medium-large sized lens or another body, but probably not both. You may have noticed that you can’t see much of the gear that’s either side of the DSLR (the 70-200 and flash are on the right and the 17-85 and 50 are on the left). Due to the narrow opening they aren’t that easy to access either. I could possibly remedy this by putting the DSLR on one side, but then the camera would be harder to access which somewhat defeats the point. 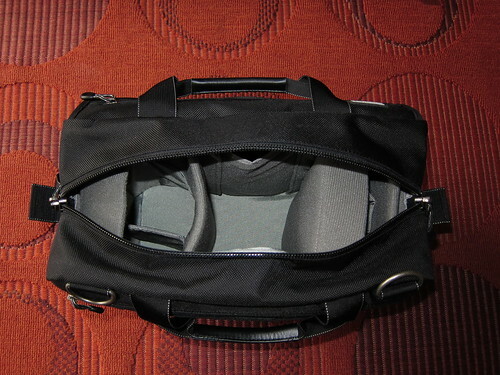 To be fair, allowing a wider opening would compromise the look of the bag somewhat, and it’s only an inconvenience when I want to change lenses and quick access isn’t very important. This is a sharp looking but understated bag that is very well made. It blends in well and is a perfect size for my needs, so I’m happy with the purchase. For more info see the manufacturer’s site. 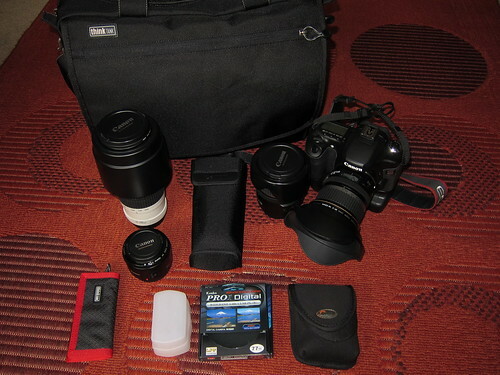 This entry was posted in Photography, Reviews and tagged Photo Bag, Review, ThinkTank on November 29, 2009 by Alex.